Earlier this year we at Kent Archery asked if there was any interest in setting up a sub-group to provide Field Archery for the members. The response was encouraging and we promised that once we had sorted out the details, we would invite you all to a meeting to explain. So the date for your diary is 7.30pm on Wednesday, 01 October at Medway Archers' club house at The Strand Approach Road, Gillingham ME7 1TT. All KAA members with an interest in Field Archery are invited - and bring your own chair, as seating is quite limited. An indoor county match against Essex, Middlesex & Surrey has now been confirmed for Saturday, 29 November 2014 at Sittingbourne Community College. This is quite early in the indoor season, so it is more important than ever for anyone who wishes to be considered for team selection to ensure that their scores are submitted very promptly - the cut-off date for receiving scores in time for the selection meeting is Friday, 31 October 2014. The team selection policy explains the requirements (page 4 is especially relevant); however, given the timescales involved it is strongly recommended that archers submit their own score returns, to make absolutely sure. Please note that, as stated in the policy above, score returns must be sent to the county Records Officer, not to the County Captain, as it is the county Records Officer who chairs the Team Selection Panel. If you intend sending your score return by post, please either check with your club Records Officer for the correct address, or contact the County Records Officer by email first - this website does not contain or disclose private mailing addresses. The Royal Foundation of The Duke and Duchess of Cambridge and Prince Harry and the Ministry of Defence, are proud to announce the lnvictus Games presented by Jaguar Land Rover. Wounded, injured and sick Servicemen and women will compete across 13 sports, including archery, from 10-13 September 2014 at venues made famous by the London 2012 Olympic and Paralympic Games. The archery event will take place on Friday, 12 September 2014 at the 'Here East' venue in the in the Queen Elizabeth Olympic Park. Competition will include recurve and compound bow-styles shooting at 18m during 2 sessions. Tickets are available for all sports events and BBC2 will be televising highlights each evening. When the date of this year's AGM was discussed at last year's event, there was concern that the normal date (the 3rd. Sunday of November) might clash with a tournament; it has turned out that this will not in fact happen and so the KAA AGM will be held on its customary date, Sunday, 16 November 2014 at Medway Archers' clubhouse. Please therefore ignore the date shown in recent newsletters and accept our apologies for any confusion that might have been caused. Official notification should now have been received by all Club Secretaries and Direct Members; if any Club Secretary or Direct Member has not receive their copy, please urgently contact the County Secretary. If you have received a prefilled nomination form, but wish to nominate an alternative member for any post, please download and print the form below, then return to the County Secretary, as described in the notification letter. Even time for light relief. The Kent team travelled to Spelthorne, Middlesex for the annual 3-way county match against Surrey and Middlesex and this was the first outing for the new county team strip, which was greeted with enthusiasm by our team and the other counties present. We were able to field senior teams in all four bow-styles (Compound, Recurve Freestyle, Recurve Barebow and Longbow) plus a junior team shooting Recurve Freestyle. Seniors shot the traditional York and Hereford rounds and juniors the Bristol round, according to their age - that's 12 dozen arrows at 3 different distances, with half of the arrows at the longest during a marathon of a morning! After a complete day's shooting, Kent took second place behind Surrey, trailing by less than 8/100s of a point for each arrow shot! Read more about the 3-way County Match, 24 August 2014. Download results of the County Match, 24 August 2014. We apologise for any confusion that might have been caused. Official notification should be received by all Club Secretaries and Direct Members by Sunday, 07 September 2014; if any Club Secretary or Direct Member does not receive their copy, please urgently contact the County Secretary and copy to the Chairman. The results for this year's inaugural Para-Archery Championship and Festival at Sittingbourne Community College are now available after a longer than normal delay due to illnesses. Official notification will shortly be sent out to Club Secretaries and Direct Members. The weekend of 28 & 29 June saw the second National County Team Championships take place, once again hosted by Lilleshall National Sports and Conferencing Centre, Shropshire. Kent Archery Association were represented at this event in the Gents Compound division. The three archers comprising the team were team captain Chris Horan (Castle Moat and Folkestone Bowmen), Mike Kells (Swan Archers) and Steve Batey (Ashford Archers). d some outstanding individual results. Read more about our success at the National County Team Championships 2014. Download results of the National County Team Championships 2014. Now that Recurve Barebow archers will receive separate championship status at our Outdoor Target Championship each year, we recently appealed for sponsors for a set of new trophies for each of the gender/age group classes. And to anyone who is leaving it to the last moment to enter this year's championship on Sunday, 17 August 2014 at Vigo RFC, the tournament is already very close to capacity and a waiting list is likely before we reach the closing date for entries - you are strongly advised to send in your entry form for the 2014 KAA Target Championship quickly! The Kent FITA Tournament was last held at Hadlow College in 2002, but after a number of requests from members, it was	revived this year but now with added Star and World Record status for the WA 1440 rounds and UK record status for the Metric rounds. Even though the decision to hold it was made fairly late in the day, the number of competitors was 50% up on that last event in 2002 and it is obvious that the aspirations of our members has changed over the years. So we are looking for your comments about this year's event and suggestions about what form the tournament should take in future years. Read more about the Kent WA Star Tournament. Queenborough Archers have reported the theft of 3 Matthews Genesis compound bows from the their outdoor venue, one right-handed, one left-handed and one fully adjustable in bright green. All of the bows were in cases, complete with Proton scopes, quivers and wrist releases. If anyone comes across equipment answering to this description being used or offered for sale, they are asked to contact Vince Telford at Queenborough Archers, who might be able to help identify whether it is the stolen equipment. 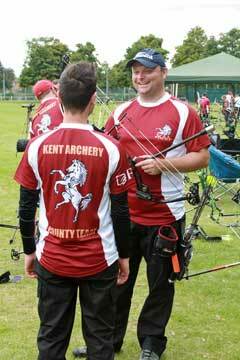 The closing date for entries for the Kent Target Championship, which will be held on Sunday, 17 August 2014 at the Vigo RFC ground is now less than 6 weeks away (Saturday, 02 August 2014), but the event is already getting very full. We strongly advise anyone who wishes to enter and hasn't yet done so, to get their entry form for the Kent Target Championship in very quickly, because it looks very likely that a waiting list will be needed before ever we get to the closing date! Remember - entry is on a 'first come, first served' basis and spaces are limited, so entering before the closing date does not guarantee you will get in. A number of changes have been made recently to improve accessibility of this website to visitors using screen-readers. It is our intention to keep to the highest standards to ensure that anyone using assistive technologies will have the best possible experience. 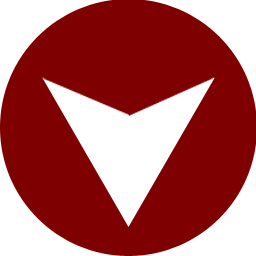 If you are using this website with a screen-reader and encounter any difficulties, please contact the webmaster and we will try to work with you to improve the website and improve our understanding of the kind of issues you face. You tried archery at school or on holiday? You watched the archery at London2012? You've been wanting to give it a try ever since? Well, now you can - and it's completely free at the Archery Big Weekend, over the late May bank holiday weekend from Saturday, 24 through to Monday, 26 May 2014 at clubs all over the country. But please note that different clubs will host the event on different dates and times over the weekend. In Kent the Archery Big Weekend will be hosted by Sittingbourne Community College on Saturday, 24 and Sunday, 25 May 2014 and by Castle Moat and Folkestone Bowmen on Saturday, 24 May. For a national map, details of clubs up and down the country that are involved and how to get in touch with those clubs, please check out the Archery Big Weekend on the ArcheryGB website. Calling all KAA members with an interest in Field Archery! 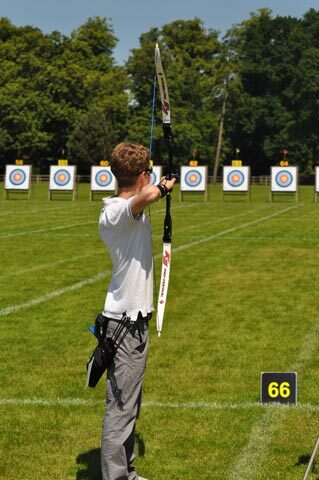 At the KAA committee meeting yesterday (12 May 2014) it was agreed that Kent Archery would explore the setting up of a self-financing sub-group to focus on Field Archery. It is recognised that members of the association would like the opportunity to venture into this aspect of our sport, but do not have the access that would allow it. This group will be known as Kent Archery Field (KAF) and will be answerable to the Operational Committee. It would be responsible for providing a number of shoots during the year as well as a Field Championship. Membership is to be open to all KAA members for an additional annual fee of approximately £25, although the final costs are still to be determined; this fee would cover all costs involved in providing 6 days shooting throughout the year. KAA members who do not subscribe will be able to take part by paying a 'green fee' on the day of about £7. Please can all those members who would like more information on this venture please indicate their interest by emailing the KAA Chairman by the end of June. If there is support for this initiative we will move to the next step, so once we know the names of those interested parties we will be in touch. I hope you will agree that this is an exciting opportunity to expand field archery to all KAA members. We would like to thank all those clubs and members who cast their votes at the GNAS AGM on Saturday, 26 April 2014. The total number of votes cast relating to each of the resolutions this year were far greater than normal - double what has been the case in recent years. Probably the most important matter to be voted on was the proposed change to the Articles of Association which required a majority of at least 75% of the votes cast to be carried; in fact 89% of the votes were in favour, so the changes have been accepted and work can now start on implementation. Next year's GNAS AGM will be held on Saturday, 18 April 2015 at the Royal Agricultural University, Cirencester. Read more on the ArcheryGB website about the Governance Review. The Index magazine is a free publication that is delivered to houses in the Sevenoaks, Tonbridge, Tunbridge Wells and Crowborough areas. The latest edition features an impressive double page article about archery (see pages 30-31) with contributions by Malcolm Brady, one of the founder members of Tonbridge Archery Club! Alternatively you can read the article online. The Kent FITA Tournament was last held in 2002 at Hadlow College, but was eventually dropped from the calendar because of a combination of problems finding an organiser and poor support for several years. In response to requests from members, it is now back and with added World Record and World Archery Star status - so it is now known as the Kent 'World Archery Star' Tournament and will be held for one day only at the Vigo RFC ground on Sunday, 22 June 2014. It will also include ArcheryGB Metric rounds for archers who do not wish to shoot the full distance for their gender and age group, but these rounds will only hold UK Record Status and will not be eligible for World Archery Star awards. Details and entry form are now available. You will no doubt have noticed that all KAA tournament entry forms now contain a requirement that archers can only enter in the name of their 'first claim club' or as a Direct Member (if they are one). This comes about because of ArcheryGB/GNAS Law 20b that says which club, county and region an archer can represent and what happens if an archer decides to change club. Although this law has been around in its present form for many years, it is unfortunately not well known or understood, so we have published a short guide (with examples) to its practical implications, including what you can and can't do if you change clubs. Congratulations go to Mike Kells (Swan Archers) who shot a perfect 864 for the Western round at Swan Archers' Spring Shoot just over a week ago. He set a new club record and, subject to ratification at the next KAA committee meeting, looks to have taken Richard Clark's (Abbey Bowmen) county record of 862 that has stood for just over 6 years. To make it even more impressive, while much of the county was enjoying a mild spring day, the tournament venue in Swanley enjoyed(?) everything bar snow - including a couple of spells of heavy hail! ArcheryGB has been looking how it should change the way it is governed to bring it more into line with modern requirements, not least so that it can respond more easily to changes in the sport environment. The second round of membership consultation has finished and thanks must be given to those members who gave up time to attend the local meetings held in November and February. A number of important changes to the Board of Directors and the Society's Memorandum and Articles of Association (its constitution) are now being proposed, but before any changes can be made, they must be approved by the Annual General Meeting in Derby on 26 April 2014.
d in the AGM information booklet that has now been sent to every Club Secretary and Direct Member of ArcheryGB. We cannot stress enough how important it is for members to read the proposed changes and ensure that their vote is cast at the GNAS AGM. Obviously it is not practical for every one of us to attend in person, but if someone from your club is going, ensure they are entitled to vote on behalf of the club; if nobody from your club can attend, make sure that your club has appointed a proxy to vote on your behalf. The entire process is explained in the AGM information booklet, and is not unduly complicated or onerous. However it is important to note that any change to the Club Elector or any appointment of a Proxy must be completed in advance - if you just rock up at the meeting with a signed piece of paper from the club, you cannot vote on their behalf. Over the past few years the number of barebow archers taking part in competitions throughout the county has steadily increased. The archers are as dedicated and competitive as any other bow type and as a county we have a proven track record in barebow with National Champions, both as junior and senior. 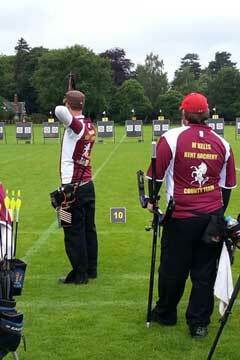 Up to now, however, barebow archers have not received trophies at the county's Outdoor Championship. This year, as part of Kent Archery Association's drive to develop all forms of archery, as well as the archers themselves, barebow archery has been given County Championship status. As such, Kent Archery Association wishes to award trophies for all the barebow categories. With this in mind, we are asking for donations of £50 from clubs, companies or individuals to enable us to purchase a set of trophies of a standard fitting to a County Championship. Each trophy will bear the name of the sponsor and will be presented annually at the County Outdoor Championship, and a result sheet and press release will be circulated to the local papers. We currently need 12 new trophies. Anyone interested in contributing to this opportunity in Kent or who has any queries, please do not hesitate to contact Lisa Kenyon, the tournament organiser. Archers who achieve Kent County Bowman classification or above during any year are invited to the following year's County Invitation Tournament - this year's event for those who achieved it during 2013 will be held at Vigo RFC on Sunday, 04 May 2014. The invitations were sent out during this last week to club Secretaries; if you believe that you have qualified, but have not yet received your invitation, please check first with your club Secretary whether an invitation has been received and, if not, check with your club Records Officer that your scores were submitted to the county Records Officer last year. If they were, then please contact the county Records Officer urgently. At yesterday's meeting of the KAA Operational Committee it was agreed to add the "World Archery 30m VI Round" to the list of records maintained for visually impaired archers. It has therefore been added to the current Para-Archery Records booklet for outdoor target archery. Back in November, ArcheryGB held the first round of consultation meetings, to explain the recommendations that came out of the independent governance review and to find out what changes members would like to see in the governance of the society and, in particular, to the composition of the Board of Directors. A further round of meetings is currently underway and the first of those meetings was held in Maidstone last Monday. The first part of the meeting concentrated on the future shape and size of the Board of Directors; the current proposals were explained and generally well received. This was followed by a work-shop on the subject of "communication between members and 'head office'" (an area in which ArcheryGB has often been criticised in the past), concentrating on what information members want to receive and feed back and what methods could be used for this. We would like to thank all of our members who were able to attend and take part. d in a major change to the GNAS M&AA (its 'constitution') that will be put to the Society's AGM on 26 April 2014. ArcheryGB will post more information and news about progress once the current round of meetings is completed. d the creation of a county Para-Archery Championship. The event will be held on Saturday, 26 July 2014 at Sittingbourne Community College and will include two competitions. The first is the county championship itself, which is open to all KAA members who hold a current ArcheryGB or BBS classification. The second is the Festival, which is open to all disabled archers whether or not they are from Kent, whether or not they have a formal classification and whether or not they are able to shoot the full distances required for the championship. By holding the two competitions together we hope to cater for all para-archers, whether they want to engage in serious competition or take the opportunity to shoot in a friendly atmosphere. The details and entry form are now available. World Archery will shortly stop using the "FITA" name entirely and a number of rounds that include the old name will be renamed. We will normally also prefix the names of World Archery rounds with "World Archery" (or its abbreviation, "WA") to improve clarity. These changes were made to relevant policies a few weeks ago and now the county records have been updated with the new names - but please note that only the most recent edition of each affected records booklet has been updated. Read more about policy changes due to changes to World Archery round names. you can still display all the records approved during the current year or the previous year, but now you can also make your own custom selections - for example you can choose to only include current records, records held by a particular person or records held by all members of a particular club. It can take a few seconds to process a selection, so you might need to be a little more patient, especially if you select a large number of records! This new facility does not replace the County Records Booklets, which continue to be the official list of records as at a particular date and of available records. This is because the selection process currently only includes actual records that have been approved - it does not yet show 'vacant' records (those for which no claim has ever been received), of which there are many! Read more about the new county records development on the website. Archery GB has launched a nationwide search for female recurve archers with a disability as part of their 'Chasing the Dream' campaign. Working in conjunction with the Performance Pathway Team, a collaboration between UK Sport and the English Institute of Sport, they are seeking focused and motivated individuals who have the desire to represent Great Britain and reach the Paralympic Podium. The ultimate aim of the project is to identify archers who have the potential to fast-track their development and compete at the 2016 Paralympic Games with a secondary aim of finding archers who can be developed for the 2020 Paralympic Games. This campaign offers an exciting opportunity for existing recurve archers to attempt to take their performance to the next level, for compound archers to examine the possibility of transferring to recurve bows and as an access point to sport for new archers who wish to pursue a Paralympic career. If you are female and believe you have the dedication and potential to reach the sport's elite as a recurve archer, then click "Read more" for further information and to sign up. The closing date for applications is Monday, 03 March 2014 at 5pm. Read more on the ArcheryGB website about the Search for Paralympic Archers. These changes have been made to bring them in line with current performance levels in the county and to provide a realistic basis for considering archers for county team selection. The new thresholds come into effect immediately. The KAA Operational Committee has approved changes to three key policies, all of which take effect immediately. All three are now available for download and copies are being sent to club secretaries and direct members. Read more about the changes to county policies. Chris Fletcher-Campbell is now the acting secretary for SCAS and his contact details can be found on the SCAS Website. Remember though that the county and regional element of all membership renewals and new membership registrations should always be sent to the county Treasurer anyway, as described in the Payment of Membership Fees section of our Membership System guide. It is with sadness that we have learned of the death of Tom Foy who passed away on Monday, 09 December 2013. Some of our longer established members will remember Tom for his archery shop in Hawkhurst, for his books on archery technique, and his endless supply of humorous archery anecdotes. Tom's involvement in our sport goes back to the 1950s and covers the whole breadth of the archery. Read more about Tom Foy. Following feedback from clubs, this year's Archery Big Weekend has been brought forward from the August Bank Holiday Weekend to the Spring Bank Holiday weekend, 24-26 May 2014. At the moment this is just a date for your diaries, but more information will become available shortly. Read more on the ArcheryGB website about the Archery Big Weekend. In spite of its name (which exists for historical reasons) the Mid-Kent League is not confined to the middle of the county! The league involves 14 Kent clubs throughout the length and breadth of the county and matches take place every month from April to September - it is therefore one of the most important activities in the county, involving a considerable number of our members. In response to questions about the league, the time has come to include some useful information here on the KAA website and a start has been made to do just that.